How the effort to discredit special counsel Archibald Cox backfired in 1973. President Donald Trump and his lawyer Rudy Giuliani are increasingly escalating their attacks on special counsel Robert Mueller’s investigation, labeling it “corrupt” and partisan. So will it work? History suggests otherwise. Those of us who remember the Watergate scandal should recognize the tactics as being straight out of Richard Nixon’s playbook in 1973. Nixon’s effort to discredit then-special counsel Archibald Cox did not succeed, however, and ultimately led to Nixon’s resignation and the criminal convictions of his closest aides. With his back against the wall, Nixon seized on what has become a Trump trademark — attacking the media. In a White House recording of a telephone conversation between Nixon and his chief of staff Alexander Haig on May 24, 1973 — taped less than five months before Nixon fired Cox during the infamous Saturday Night Massacre — Nixon, in language spiced with vulgarities, claimed that Cox was “going to try the president,” a suspicion that animated Nixon’s crusade to discredit Cox. Nixon then sent his counsel, J. Fred Buzhardt Jr., to meet with Cox. In a June 6 telephone call, he directed Buzhardt to challenge Cox’s inquiry. “I want you to say quite candidly, ‘Mr. Cox, it’s all over town that you’re out to get the President. Now if that is the case we want you to know we’re ready for a fight.’” In that same telephone conversation Nixon told Buzhardt to accuse Cox of bias. Nixon ended the call by telling his lawyer to “Play a tough game.” After the meeting, Buzhardt told Nixon that Cox was refusing to back down and had rejected Buzhardt’s claim that the separation of powers in the Constitution prevented Cox from moving against Nixon. This, too, echoes the current Mueller probe, which Giuliani has attacked as too broad and based on biased information. Like Nixon’s emissary 45 years ago, Guiliani has denigrated the prosecutors and castigated Mueller’s prosecution team as trying “very, very hard to frame” Trump. The intense campaign to discredit Cox eventually culminated in Nixon’s order on October 20, 1973 to dismantle the special prosecutor’s office. The next day, the White House press office released a statement, echoed by leading Republican Sen. Hugh Scott, that Cox was biased, as shown by a leak of information about the investigation. Of course, that strategy backfired. Within two weeks, Nixon was forced to appoint another special prosecutor, Leon Jaworski, who would go on to successfully prosecute Nixon’s key aides, turn over a satchel of evidence to the U.S. House Judiciary Committee considering articles of impeachment and win a historic unanimous decision by the U.S. Supreme Court ordering the White House to release the tapes subpoenaed by Jaworski’s team. While Trump has the echo chamber of conservative media outlets and his own Twitter account to amplify his views, he does not know what the multiple cooperating witnesses have told Mueller’s team. History shows that Nixon miscalculated and now so does Trump. While Trump has the echo chamber of conservative media outlets and his own Twitter account to amplify his views, he does not know what the multiple cooperating witnesses have told Mueller’s team nor what evidence the grand jury has gathered. He also does not even know who among his staff may have flipped. The New York Times reported on Friday that the FBI was in possession of a taped conversation between lawyer Michael Cohen and Trump, a revelation that will only add to the speculation over whether Cohen plans to implicate his longtime boss. Trump does know that former campaign or White House aides — Michael Flynn, George Papadopolous and Rick Gates — have already taken plea deals and are presumably cooperating with the Mueller probe in some way, but does not know what they are telling prosecutors. Indeed, fear of the unknown may be the root of the White House's constant attacks on the legitimacy of Mueller's investigation. Trump’s branding of the Mueller investigation as a “witch hunt” may ultimately be cited as evidence of Trump’s efforts to impede the Mueller investigation by attacking its legitimacy and stirring up public resentment. Similar tactics proved damaging to Nixon. 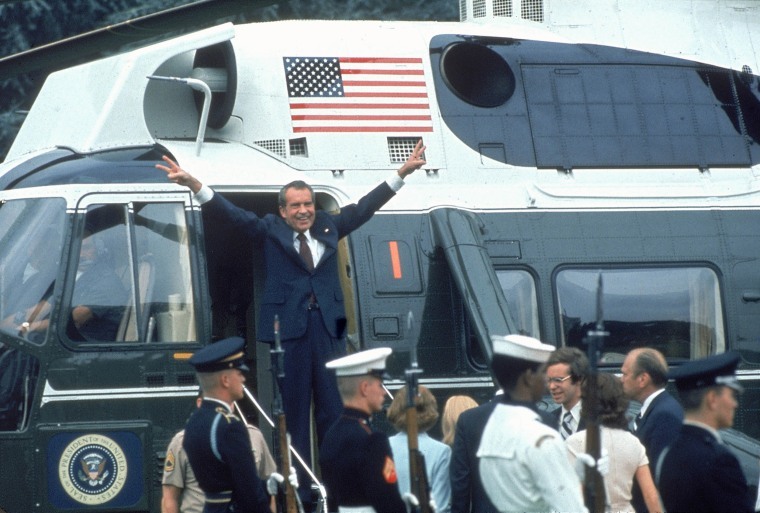 In its final report, the House Judiciary Committee concluded that that Nixon’s efforts to undermine the special prosecutor’s investigation amounted to obstruction of justice as specified in Article I of the Articles of Impeachment. Like Cox then and Mueller now, investigators are bound by strict grand jury secrecy precluding them from arguing their case in the public forum. But the investigation goes on — and the noose is tightening. Michael Conway served as counsel for the U.S. House Judiciary Committee in the impeachment inquiry of President Richard M. Nixon in 1974. Conway is a fellow of the American College of Trial Lawyers and a retired partner of Foley & Lardner LLP in Chicago.